many a long year ago, a few colleagues and i travelled to scotland to participate in a team triathlon, an event in which three people each take on one discipline against others doing the same thing. due to the size of the swimming pool, the triathlon had to be run over an extended period of time, with only four swimmers in the pool at any one time. disappointingly, this meant that after a warm-up ride to recce the cycle course, i had to stand or sit for the next hour and a half until it was time to compete, rather negating the point of doing so in the first place. in order to alert the swimmer that sufficient lengths had been completed, a red paddle board was dipped into the water, but unfortunately, the chap in my team failed to spot this and completed an extra two lengths. to add insult to injury, the bike ride time was started at the point when he ought to have finished, rather than the when he actually did so. according to several notices posted around the transition area in which the bicycles were placed, there was to be no running in this section, a regulation which i dutifully observed. sadly, i appeared to be the only one, yet none of the others were penalised for skipping merrily towards the roadside. a mere matter of seconds after i had begun my ride, the heavens opened; before the first kilometre had been completed, there was water flowing out of my footwear. 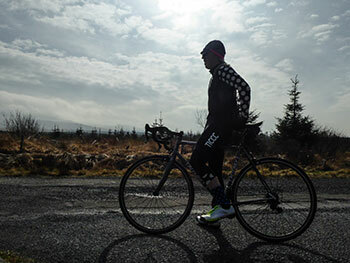 it is not, however, merely triathlons that have need of transition, as was demonstrated during yesterday's sunday ride. 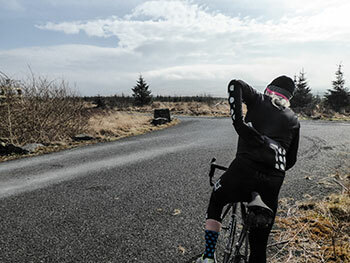 while my fellow peletoneers were clad in shorts and bare knees, i augmented my own pair of thermal bibshorts with a pair of kneewarmers, a feature that had pervaded during the previous week's riding. i cannot be rushed into the acceptance of sartorial folly. daphne and andrew at this-is-cambridge, seem well attuned to this sense of dress, having sent me the excellently named long-sleeved, thermal omloop jersey, a garment which pushes the border between jersey and jacket, with neither emerging as specific victor. it is strikingly decorated in black and white, with the left sleeve sporting large white polka dots, which are not only large and white, but reflective into the bargain. the rightmost rear pocket is similarly decorated. i confess, i could live without the large emblazoned tic cc on the left breast, but since it had no power to slow me down, i figure i can put up with it. however, it is a nice touch to feature tic's motto of higher, further, faster on the lower section of the full-length zip cover. the unisex jacket has been coated with durable water repellency, making it at least showerproof in the face of adverse weather conditions. however, the obligatory three rear pockets offer more than sufficient space in which to carry a scrunched up waterproof jacket, should you intend to ride in less salutory conditions. oddly, while the length of the sleeves is nigh on perfect, i found the torso length just a smidgeon too short. i'm sure this obviates any bunching in the sprint, but it did tend to leave an unfortunate gap where the thermal bibshorts worn below, reached their lowest point. to compound this slight misadventure, the mesh baselayer could really have done with being a couple of centimetres longer. rather obviously, depending on your body's proportions, this might not affect you at all, but as one long of torso, perhaps i ought to have heeded this-is-cambridge's advice and sized up the way, though the rest of the jersey fitted just ginger peachy. the bibshorts, aside from the observation made above, are quite superb. i admit that i've not tried them without the colour co-ordinated kneewarmers (should i have the polka dots on the same side as the sleeve, or go off-piste and pop them on the opposite leg?). currently, if you purchase the thermal bibs along wth the kneewarmers, you can save 20%; you'd be mad not to. i have previously favourably reviewed a tic mesh baselayer and this black and white variation is no different. i would prefer a higher neckline in a baselayer designed for the colder weather, but, honestly, it hardly proved to be much of a problem when riding. 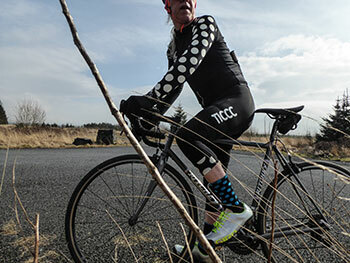 the omloop socks, however, even without the aid of overshoes, were as cosy as a pair of really cosy things. i'm a great believer in wearing matching riding kit, even during my annual transition periods; i doubt there's a rule that says you can't match one brand with another, but baselayer, bibs, jersey, kneewarmers and socks all from the one source is a bit like owning an apple computer where hardware and software can be made to match. colour and quality in perfect harmony. if i was guilty of designing my own cycle clothing, the motto emblazoned on the front would likely be cold, wet and windy, the very conditions in which i, several times, attempted to ride higher, further, faster clad in the finest omloopery. 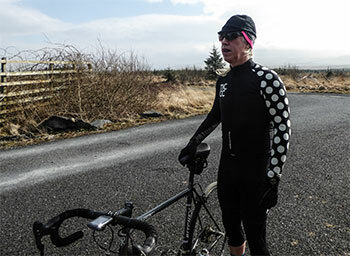 the lined jersey keeps both cold and wind in abeyance, while the comfort factor is beautifully handled by the bibshorts. the length of the jersey's sleeves was most impressive. the pad is easily amongst the finest on offer anywhere. no matter on which side i placed the white polka-dotted kneewarmer, they obviated any tendency towards easter knees as espoused by the late david duffield. if the weekend's weather was anything to go by, the hebridean transitional period is likely to continue for a good while yet, before it all starts again in august (if only i was kidding). the omloop long-sleeve thermal jersey is available in sizes ranging from xs to xl at a cost of £155. the thermal bibshorts can be purchased from xs to xxl only in black at a price of £175. the 3/4 length kneewarmers, if purchased alone, cost £50 per pair. sizing is xs to large. the long-sleeve baselayer is available with black or white hoops, in sizes xs to xxl and is priced at £44. 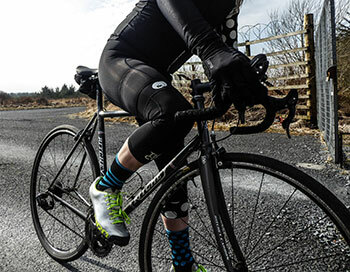 the omloop winter socks, neither of which match each other apart from colour (black/blue, or black/pink) cost £19.50 in sizes 35-39, 40-43 and 44-47).